These are our standard colours. We can produce non standard colours, please contact us for details. Black and White are also available. To gain an idea of how a colour looks in real life, click over the colour square and it will take you to pools painted in that colour. You may like it to blend in or contrast with colours around your pool, such as a tile line, pavers, vegetation. See the Project Gallery to give you some ideas. A considerable amount of “colour” comes from the sky….so white becomes blue, pale jade becomes a tropical blue etc. Darker colours mean warmer water, and so can extend swimming season in the south, yet may prove too hot to cool you down when you need it most. 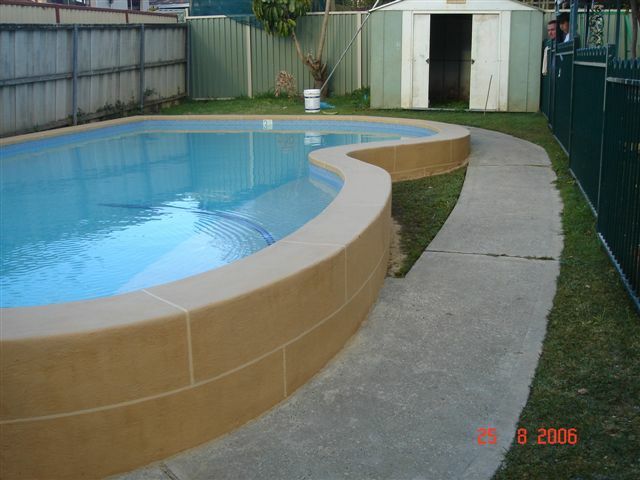 Epotec is a functional coating meaning it’s mainly designed to protect your pool shell from chemicals, water, fats etc. It does come in range of colours however as with all epoxies they will chalk slowly over time and may take on a slight yellow tinge. Lighter colour is best. Salt water pools (and some chlorine pools) will leave a white residue on the surface. This is mainly dissolved “salts” in the water, much like after you have been swimming is the sea and have a white crust on your skin. It’s not detrimental to Epotec, however will show up more on darker colours. You can wipe pool surfaces to remove, however in a splash zone can be quite noticeable and thus a lighter colour should be selected.